I’m assuming you already named your puppy. If not check out the article I wrote about how I named my dogs: Naming Your Dog. 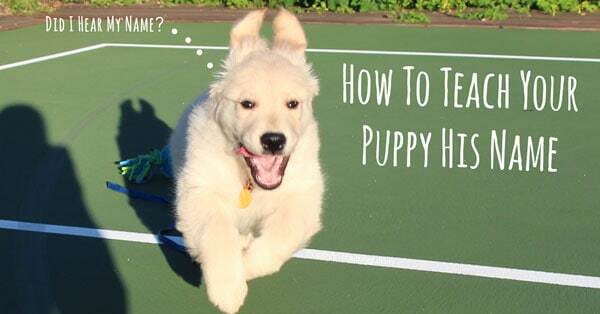 If you’ve already named your puppy then it’s time to learn how to teach your puppy his name. One of the most important things you can teach your dog is his name. It can save his life…literally. How you might ask? Well what if your dog was chasing a ball into the street? What if a car was coming? If your dog knows the meaning of his name he will respond and come to you when called even while in the middle of playing. 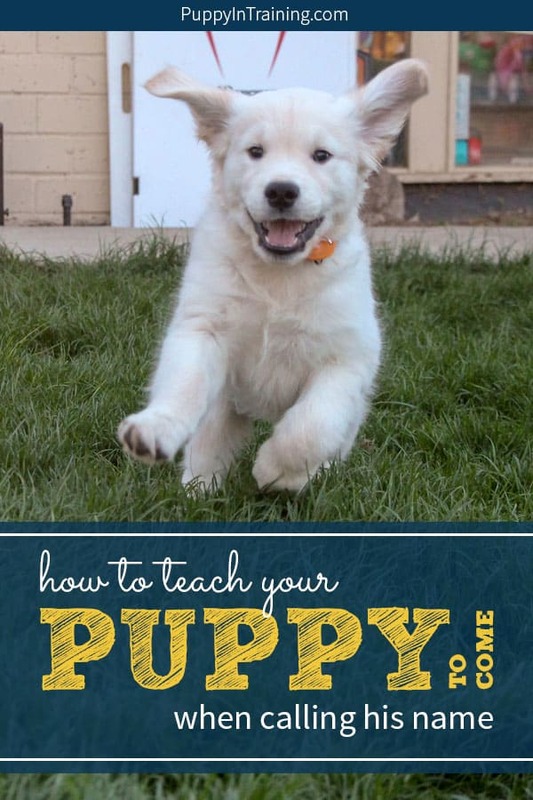 Of course, as I mentioned in my last article, How To Handle Your Puppy’s First Night At Home, training your puppy will require consistency and patience. Teaching your puppy its name is important. Use it every time you talk to him and with every command (except NO and STAY) . Never associate the dog’s name with something negative. Never scold the puppy after he comes to you, even if it has taken a while to respond. Please do not change the puppy’s name or call him by a nickname. That’s it! Short and simple. However it is much easier said then done. Golden puppy, Bear learning his name. Not using the puppy’s name with NO and STAY – This is difficult to do when you try to use their name with every other command. Try to be consistent. I still will occasionally use Linus and Stetson’s name with the NO or STAY command. Also, you might be wondering why can’t we use our puppy’s name with the STAY command? The main reason we don’t associate our dogs name with the STAY command is because the puppy’s name should be synonymous with the COME command. When I say my puppy’s name he should COME to me. That is quite the contradiction from STAY. It is also very difficult to avoid using your dog’s name with something negative. My biggest problem is when Linus or Stetson does something wrong I’ll say their name in a very negative voice. Sometimes I catch myself…sometimes I don’t. Scolding your puppy when he comes to you…another bad habit that can be difficult to break. Why wouldn’t you want to scold your puppy after he comes to you? Lets say he just chewed up your new shoes and you say “Stetson Come” He comes to you as you commanded (made the correct choice). Then you scold him! Do you think he’s going to come to you next time? No! You should praise him when he comes to you. The only time you should scold your puppy is when you catch him in the act of doing something wrong. Not changing your name or calling your dog by a nickname is more of a Guide Dog thing, but is also good for a young puppy. It can be confusing for a young puppy if your calling him by several different names. I tried hard with Linus, but my sister, my room mate, and my ex-girlfriend each had a nickname for him. I constantly told them not to use nicknames. Here are a few they used: Linie, Linikins, Linoceros, and Puppy Chow. I’ve been very strict with Stetson and people are usually more understanding since he’s training to be a guide dog. Here comes Charlie! Teaching this puppy his name. The first game we always play at our Guide Dog training class is the Name Game. How does it work? Take your dog to the park and keep him on leash (it works a little better if you have a longer leash maybe about 10 feet). Give him about 5 feet to wonder away. When he’s not looking call his name with an excited voice and make sure he comes to you (if he doesn’t come reel him in with his leash). When he gets to you give him tons of praise! 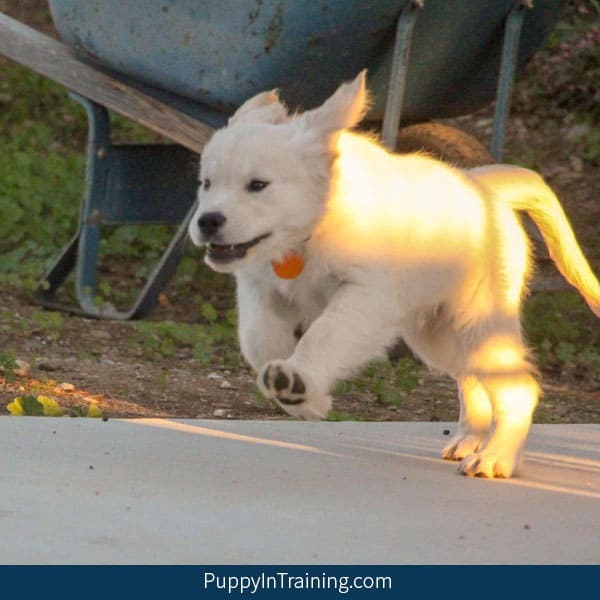 Repeat the exercise over and over again until your puppy is consistently returning to you when you call his name. QUICK TIP: This might be the only time you’ll catch me recommend using a flexi-leash. When working on recalls we will use either a 10-30 foot long line or sometimes we’ll use a flexi-leash. We ONLY use our flexi-leash when training our pups. Try playing the Name Game with your puppy. Be consistent and patient. Stick to the rules outlined above and your puppy will soon be consistently coming to you when you say his name. Have you played the Name Game before? Does your puppy know his name? Do you have any other suggestions for reinforcing a puppy’s name? 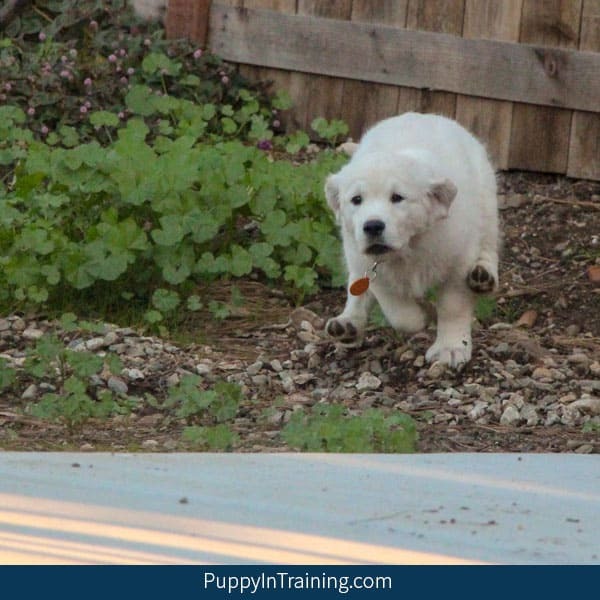 How do you teach your puppy to come when calling his name? Hii, i have two male chipit puppies which are only 3 months old, and they never seem to agree on the same thing. They are always going after each other and fighting over d same thing. I don’t know what to do, how can i make the cordial with each other? I have a “little vampire” as well, and he has a little problem with- you guessed it. Socks. Have any ideas on how to decrease his appetite for socks? Ok, so I have a puppy that I got about 2 weeks ago. He is about 7 weeks old. Im in the middle of house breaking him. My problem is that when I go to bed, I have his little bed on my bed because thats were he likes to sleep. But the problem is… he will jump down and poop on the puppy pad at night, and then come to the edge of my bed and cry until i wake up and help him back up because he is to small to jump up. But he WILL NOT jump down to pee on the puppy pad. He will instead pee on my bed. Most of the time he will do it many times through the night, which makes it were I have to wash my sheets every day. Any suggestions on what I can do. Like how to train him not to do that.